Make yourself at home in one of the 183 air-conditioned rooms featuring refrigerators and plasma televisions. Rooms have private furnished balconies. Complimentary wireless Internet access keeps you connected, while iPod docking stations help you enjoy your music in the comfort of your room. Partially open bathrooms with separate bathtubs and showers feature rainfall showerheads and complimentary toiletries. Enjoy Asian cuisine at Latitude Bistro, one of the hotel's 2 restaurants, or stay in and take advantage of the room service (during limited hours). Snacks are also available at the coffee shop/café. Relax with a refreshing drink from the poolside bar or one of the 2 bars/lounges. Local cuisine breakfasts are available daily for a fee. Featured amenities include complimentary newspapers in the lobby, dry cleaning/laundry services, and a 24-hour front desk. Planning an event in Singapore? This resort has facilities measuring 4801 square feet (446 square meters), including conference space. A roundtrip airport shuttle is provided for a surcharge (available 24 hours). Enjoy a meal at PappaMia, or stay in and take advantage of the hotel's 24-hour room service. Buffet breakfasts are available daily from 7:30 AM to 10:30 AM for a fee. Don't miss out on recreational opportunities including an outdoor pool and a 24-hour fitness center. Additional features at this Colonial hotel include complimentary wireless Internet access, concierge services, and wedding services. Featured amenities include a 24-hour business center, complimentary newspapers in the lobby, and dry cleaning/laundry services. A train station pick-up service is provided at no charge, and free self parking is available onsite. With a stay at Resorts World Sentosa - Hotel Michael in Singapore, you'll be just steps from Adventure Cove Waterpark and 11 minutes by foot from Madame Tussauds. This 5-star hotel is 0.6 mi (1 km) from Sentosa Luge and 0.1 mi (0.1 km) from S.E.A. Aquarium. With a stay at Resorts World Sentosa - Beach Villas in Singapore, you'll be within a 5-minute drive of S.E.A. Aquarium and Adventure Cove Waterpark. This 5-star hotel is 1.4 mi (2.3 km) from ® and 4.4 mi (7.1 km) from Raffles Place. Head straight for the casino, or wait for that lucky feeling while you enjoy one of the other recreational opportunities, such as an outdoor pool and a 24-hour fitness center. This hotel also features complimentary wireless Internet access and concierge services. 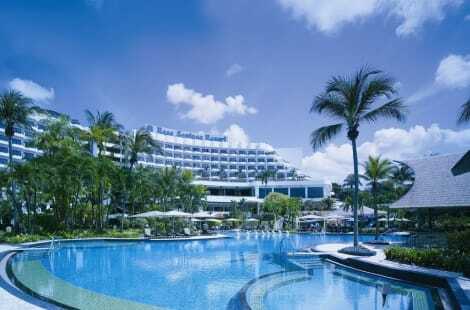 lastminute.com has a fantastic range of hotels in Sentosa Island, with everything from cheap hotels to luxurious five star accommodation available. We like to live up to our last minute name so remember you can book any one of our excellent Sentosa Island hotels up until midnight and stay the same night.